the 2007 has been a fabulous year for my running: I started it as "mid-pack runner" and it all went in crescendo up to yesterday morning, with a victory in one of the hardest road races of the Hong Kong calendar, the 30k Shek Kong "Pre Marathon" race (the race is a sort of tune up for the incoming Hong Kong Marathon in February). The race is held on a out and back course along a catch water road and around a reservoir in the TaiLam Country park. The course is really scenic, with great views of the New Territories, but also extremely tough. There are probably only 4km of flat, and some climbs were so steep that I judged more reasonable to walk for 20/30 meters rather than making a all out effort just to run. I definitely recommend this race if you happen to come to Hong Kong for the end-year holidays. The weather was excellent, the best of 2007: 14C/60F, dry, chilly wind from North. 450 Runners at the start. Graciously of the organizer, I was given the #1 bib due to my new status of "2nd best marathon runner" in Hong Kong (this is outrageous ... there should be something going wrong in Hong Kong if a middle-age grey-haired beginner can claim any similar status"). I settled in the leading pack with other pre-race favourite and let them do the pace. My HR had ups-and-down like a rollercoaster following the ondulations of the course and the splits were ranging wildly into the 3'20"/4'30" range. So I just impose myself to: a) stick with the first pack b) slow down only if the HR would have stayed too long over 170 in the flat sections. Some climbs were so tough that our speed was probably close to 10 Min/Mile but I enjoyed the scenery and I was very resolute to stay calm until 7/8km to go and later place surges either in the flat on a very steep hill with 6km to go. It all went to plan: I did manage to keep the effort into a "marathon pace" until the 23km/14Mile and on a flat section, I placed a surge, finding not much resistance from the others. The last 7k were like making a tempo run, even if a long climb at 25k mark really made me struggle (the other behind were probably struggling even more ... I later found out that I had already gained 1 minute at the top of the climb). that's it ... 1h56' as finishing time, brought home 200USD value of vouchers and this race marks really a personal achievement for myself and my running life. Yesterday was a very pleasant "Tempo Run" of 9k, done at moderately hard effort. My Polar strangely stopped reporting "reasonable" levels of heart rate right in the middle of the effort (grrr), so I went on by feeling, trying always to push at a level where I could say to myself: you can go on like this for another half hour. I did come out a 31'54", a very respectable 3'33"/k (5'42"/Mile), with HR most likely in the low 170s (judging from the effort). Anyway the purpose of the post was mainly to illustrate the feeling of the incredible difference between running in Dongguan vs Hong Kong. - reach my usual training loop of 4km, in a quiet new residential area. Pay always attention to the scarce traffic and the missing drainage covers. Avoid some trash thrown on the road. 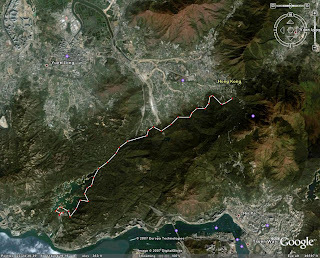 - short jog from home to reach the Shatin-Taipo/MaOnShan cycle path. 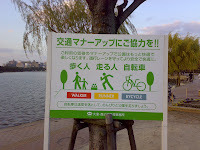 The whole path is along the ShingMun River and Tolo Harbour. It is lit 24hours and far from any traffic. All together, you have a 40km+ network of seaside cycle track. - run along the fence of the "Horse Race Course", horses are already training. They always train very early in the morning, I guess that to be a good jockey you must be a real "Early bird"
- the path is also marked every Km, since it is the venue of several races. - I run along the seaside, with a good morning breeze coming from the sea. It is very quiet, few cyclist or runner can be met so early. - I can run for 10/15 km in one direction and than back home, complete mental relaxation. - Landscape: Sea on one side, mountains on the other side. - Mental effort: low, just let the mind float to enjoy the pleasure of feeling fit. The result: is that at the same effort "easy run" (70%to 75% HRmax), in Dongguan I struggle to make 12/15km at 4'20", while in Hong Kong I could on for 25/30km easy at 4'10" !!! Enjoy the holiday period with some good run. I am eating like a pig and I will probably put up 2 kg (4Lbs). This morning I made a "fat-burning" session: running at very easy effort (HR around 70% of max): 21,1km in 1h28' (not a bad half marathon time ...). My daughter has now the habits of wandering around the house at 3am, it does not help my sleep.... only 4 hours average in the past 3 days. The weather in Hong Kong is now gorgeous: 15C/60F, low humidity. I run along the sea, with the sea rising during the run. It must have been the idyllic environment to make me feel going so easy. I am in my 2nd week back to serious training after the Marathon and legs are feeling very good. - Choi Tat Ming: run Fukuoka Marathon in 2h40' with slight bonk in the final 5k. One week later, makes his SB in a 10k (!!). Not happy, the following week-end joins the Taipei marathon with another 2h40'. - the excellent Master Chan Hwa Kwai (Keith) is clearly disappointed in running 3h03' in Shanghai Marathon on November 25th ... to recover morale, one week later runs a Half Marathon and a 10k the following week-end. One person was seriously injured while six others were slightly hurt, Xinhua said last night. The fire broke out shortly after 5pm and firemen arrived at the scene five minutes later. The blaze was put out in 10 minutes and it was estimated that it had spread over 400 square metres. Police were investigating the cause of the blaze last night. my comment: I have been in this coffee/restaurant several times. I actually makes many of my morning runs in the stretch of road in front of it because it well lightened also night time. This morning the road was still blocked by Police. Unfortunately the safety is often neglected in China and many people pay a tragic congruences. The TV reported it was an explosion from a bottle of gas. I invite comments from the expert runners reading this blog about the best HR "profile" to use during a marathon. This is my HR profile during the Fukuoka marathon. I hope it is clear enough. My max HR rate is around 197bpm. Keep in mind that my pace was pretty constant in the range 3'44" to 3'49"/min. The 5k split are very even (variance of 10 sec), so the "output" (speed) was constant. I constantly monitored the HR for the first 20k and tried to stay in the range 165-169 (MP effort). After the HM mark, HR drift slowly into a "HM/LT effort" (low 170s) and I settle into a slightly slower pace to avoid the HR climb too soon in the hi 170s (that is full Lactate threshold for me). For the last 10k, I just considered it like a 10k race and gave it all: the HR climbed right into a "10k race" kind of effort (>180bpm) for the last 5/6km. I found very positive the capability to still push the effort into the 180+bpm, compared to other marathons I did in the past, where in the last section I was incapable to go faster and the HR started to drop in the last 6/7km (typical symptom of fatigue). Competitive Sports in China is not for everybody: all the competitions are organized among "Sports School" with a calendar that is kept unknown to outsiders (the mania for secrecy is a typical trait of State Organizations here). For the "common mortals", the only events to take part in are usually "Corporate Games" or better "Danwei" Games, organized between Organizations of any sorts (companies, universities, neighboorhoods, etc). Last week was the week of the Corporate Games of our town, organized among the different factories of the area. For the employeed is one of the rare moments of doing something else apart from work on an assembly line. Saturday was the day of the "Long Distance Running Competition", for which I was very keen to have our factory to show up well. The crazy thing about the race is that the first 3 runners were awarded 1000RMB each (130 USD) + minor awards up to 10th place. This 130USD is roughly equal to 1 month salary of a worker !!!! So you can just imagine how motivated were the runners at the start of the 3500meters course. It was an easy win, even if the opponents were half my age but obviously with very precarious training. Our factory also scored a 3rd and a 10th for a impressive team performance. At the end, interview (in Chinese) with the local TV and trophy presented by the Communist Party Secretary (whom i know very well and in the future he will not miss to remind me of the race). I made a mistake like a beginner to end up 2 weeks from the race still with new shoes to test. The muscle strain was really a stupid injury. Racing shoes must be there from Wk1 of training !!! the aerobic approach paid off once more. I was never tired or overtrained, but at the same time I did probably the hardest workout in whole my life. carbo-loading with powder carbos: I recommend this. Friday and Saturday I had around 300g/day of powder carbs and gave me a real boost for race day, without having to eat tons of pasta/bread and feel heavy on the stomach. They were significantly disgusting, but once a year can be ok.
there is a interesting website in HK that keeps count of your results in terms of IAAF points and basically ends up with a local road running ranking. Saturday I went for a short shake-up in the Ohari Park, which is considered a "cult" place for the Japanese running movement. I read somewhere that hundreds of High-school and University runners gather there every day for their sessions. I got really impressed by a scene that clearly reminded me of the particular honesty of the Japanese: a woman arrived by bicycle, removed her tracksuit and started running, leaving the bike unlocked and the tracksuit hanging from the handlebar. I also had the pleasure to chat with Brett Larner, who is the author on a very interesting Blog on the Japanese Running scene. Brett was very kind on giving me some useful tips about the race. I also went for a walk to kill the time before the noon start and digest somehow the breakfast. Pre-Race set-up: it was all very much runners friendly. Changing room available and also a "last minute" clothes drop-off point was arranged 50m from the start line. Basically it was possible to warm-up and pit-stop at the toilet until 5min from the start. The Crowd: unbelievable crowd support. All the 26 Miles were lined up with people, cheering the runner with "Ganbare" (Do your best) and I even heard several calling my name. At 12.10 the gun went-off and here I was .... running a marathon in Japan ... whose time limit is 19'30" for each 5k ... after months of early morning runs in the dust/pollution of Dongguan. up to HM: the section was largely uneventful. I tucked into a small pack and tried to run relaxed, avoiding overstriding, enjoy the crowd. HR always around 166/168bpm. 10k: 37'15" (18'41' split) , 15k in 56'00" (18'45"), 20k in 1h14'44"(18'44"), HM 1'18'57"
from 21k to 31k: our pack was starting to break apart and my right leg was giving signs of tension, affecting the stride. So I decided to slow down the pace a little, I was much ahead of the 2h40' target pace and it was still a long way to go. Personally I really find these Miles from HM to 32km the most difficult, it is very easy to lose concentration and go off pace. 31k to the end: the 31km marks the turning point and the long return to the city center and the finish. It was now a 10k race ahead of me and to may amazement, the body was still able to pick up the pace to 3'45"/km. I felt like making a tempo run ... unfortunately the right leg was tightening especially while extending the leg behind the body, so I adapt my stride to run with very short steps (I was probsably looking like one of those Japanese or Chinese female runners ... their stride is so characteritic). The HR was responding to the increased effort and went into the 175/177 range. In the last 7k, I caught up at least 50 runners and I still felt in control of my body. the 40k at 2h30'10" (18'42" split) gave me the certainty that a sub 2h40' was sure. But running with altered stride was putting a lot of repssure ont he abductors and when we entered the stadium, the legs were gone and I started to feel cramps everywhere. I took the last 550m on the track as my "personal tour of honour" a good reward for all the sacrifices done. by 100m to go, I cramped without remedy but it was only a short shuffle to the finish line. Post-race: 10 minutes later after I crossed the finish line, the Asashi Shinbun Newspaper was already distributed to the crowd with a special 2-pages edition with results and commentary !!!!! I made my way to the changing area, with several spectators bowing at me in sign of congratulations ... very EMBARASSING ... I was 30' after the winner ... nevertheless I thanked everybody with large doses of bows and "Arigato". In the evening, award ceremony and farewell party: after many speeches in Japanese, many awards being presented to Wanjiru and final buffet dinner with the opportunity to mix with the top runners and taking pictures together. Overall: I am very satisfied with my race. Good training plan, good race and outstanding final 7k. I guess that my special "long runs with intervals" paid off. I ranked 154th out of 312 who finished within the time limit. Full results here. Fukuoka is a "dream marathon" for a runner: the course, the set-up, the organization all together make up for the ideal setting to run at your best. It is totally runner-oriented, without all those trade-off with commercial interest like most of major marathons. My thanks go to the organizer for setting up such an event and special thanks to Mr Ogushi and Ms Yuko for taking so much care for a "gaijin" a bit "lost in translation". I am delighted. A very even pace with a strong final 7k. The ailing right leg held almost to the end. 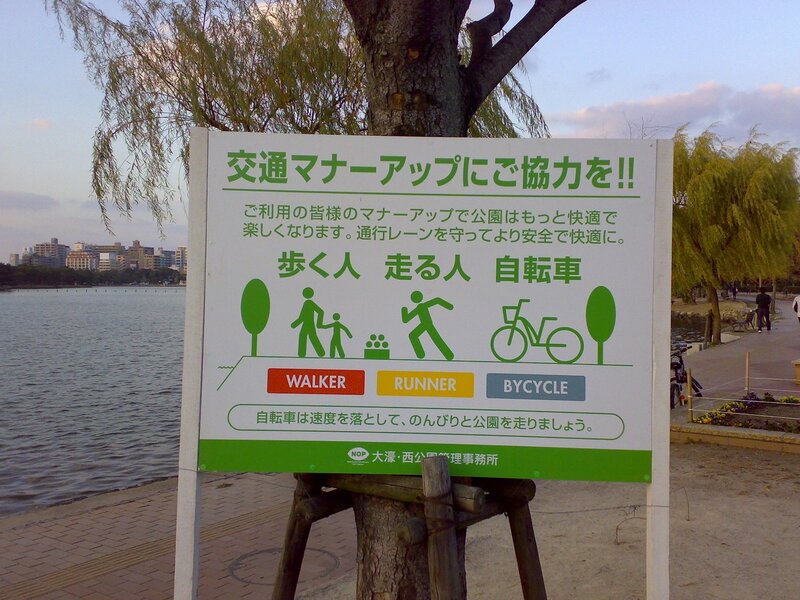 The Fukuoka Marathon itself is a superb race, the dream of every runner. Wanjiru makes a great race, but challenged until the end by Deriba Merga. -the number pick-up area consisted of 1 (one) table with 2 staff. This is the advantage of having 460 entrants. -Met Wanjiru and his Italian agent in the lift: the agent claims Sammy is in excellent shape and "tomorrow everything can happen"
-the pain in my right leg is still there, but I am intaking an unreasonable amount of Voltaren (Diclofenac Sodicum) and Ibuprufen. Finger crossed.